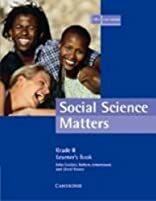 Social Science Matters gives a new look at Social Sciences. The Learner's Book includes sections on African and European culture and heritage, government and geography, South African politics, environmental and developmental issues. Skills are developed throughout the text, enabling learners to apply these skills in other general areas. Features of the Learner's Book o It contains four modules. o The text, artwork and activities work together to ensure coverage of the Learning Programme. o Critical thinking skills and problem-solving strategies are developed. Features of the Teacher's Guide o An introduction to the terms used in Outcome-based Education is included. o Specific Outcomes and Assessment Criteria are given for each of the activities. o Guidelines for assessment are included. o The book contains suggestions on approaches to Outcome-based Education and advice on where to find resources. o Guideline answers to all activities in the Learner's Book are provided. About Cheryl Reeves (Author) : Cheryl Reeves is a published author. A published credit of Cheryl Reeves is Social Science Matters Grade 8 Learner's Book.